The NERA study on the economic cost of Obama’s Paris commitments is based on junk numbers. Compliance with the terms of the Paris accord and the onerous energy restrictions it has placed on the United States could cost America as much as 2.7 million lost jobs by 2025, according to the National Economic Research Associates. This includes 440,000 fewer manufacturing jobs â€” not what we need â€” believe me, this is not what we need â€” including automobile jobs, and the further decimation of vital American industries on which countless communities rely. NERA is biased conservative but professional. Their study has 149 pages and authors with PhDs. Good stuff? No. They get their energy assumptions from the hapless EIA forecasters, specifically their Annual Energy Outlook reference case (AEO). So without the CPP and other evil green policies, this is how they see the US emissions map: Look at the coal line. 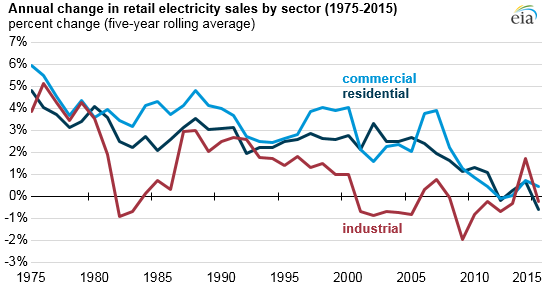 Compare the recent history of electric generation by source. Does that look like steady growth in coal to you, or a death spiral that started a decade ago? It will certainly continue. Another 14 GW of coal plants have been identified by the EIA itself as scheduled for closure by their owners. (Next to none are planned for addition.) At 6mt CO2 per GW per year, that makes a reduction of 84mt CO2 a year, over half the current burn. Methodology here. The assumed capacity factor of 80% is too high for doomed plants, but on the other hand the list is certainly a gross underestimate of the likely closures â€“ the economics for old coal plants are terrible everywhere. The two scenarios, of coal emissions rising by 8% by 2040 or falling by 46%, are quite incompatible. The scenario of growth in coal is a propagandist fantasy. Are the other components any more credible? Gas rises in the scenario by 34% by 2040. At first sight this looks possible, as gas would initially replace much of the shuttered coal. But electricity demand is flat. This is not from policy but from long-standing global trends to tertiarisation and efficiency. 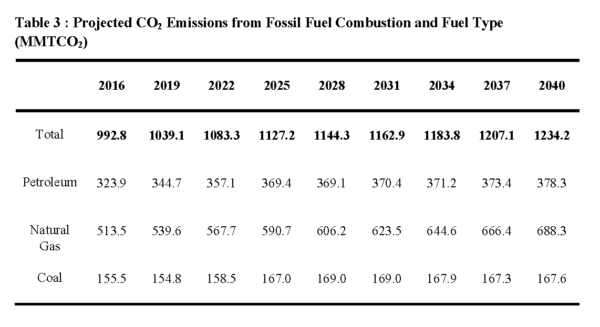 Let’s say that coal falls by 80 mt CO2/yr, and gas replaces all of it in electric generation. Gas is more efficient, so its emissions rise by say 50 mt CO2. Where do the other 125 mt CO2 a year come from? There won’t be any increase in steel or cement-making, and buildings will get more efficient from better standards of construction embodied in building codes, and from smart controls. Meanwhile, wind and solar capacity will increase rapidly. As they enjoy despatch priority, they will cut increasingly into the gas burn. Storage will add to this by reducing curtailment of excess renewable electricity. On the petroleum front, NERA and the EIA see no electric vehicle or self-driving revolution. Stanford’s Tony Seba predicts that all new vehicles will be electric by 2030. I’ll go with the CW that he is overoptimistic on the timetable â€“ but not hugely so.Â VW – VW! – expect 20-25% of their output to be all-electric by 2025 , not counting the hybrids. Ford have just replaced Mark Fields as CEO, lukewarm on the electric transition, by the former head of the self-driving car division. Major heavy truck makers like Volvo and MAN are putting real money into electric powertrains. Electric buses have already captured a fifth of the Chinese bus market, and are starting to win midsize serious orders elsewhere (Long Beach, Charleroi). By 2040, petroleum-powered land vehicles will be a small niche. The EIA’s AEO reference case used by NERA is a piece of junk. Since it’s the basis of the whole analysis, so is their estimate of the gargantuan costs of compliance with Obama’s Paris commitment. Trump has no actual policy to change the trends outlined above. Making it easier for coal owners to pollute watercourses and steal the pensions of their retirees, and gutting research into clean energy, are mere acts of spite, as per Krugman. They make no difference to the trends. My guess is that the poor USA delegation of Trumpwraiths (the USA can’t even file the notice of withdrawal till November 2019, and will still technically be a member for another year after that) will have the embarrassment of filing a progress report to the Paris COPs that it is fully complying with Obama’s evil and job-destroying commitments. CO2 is the least of coal's pollutants to worry about. Good riddance. But it doesn't quite seem fair to criticize the reference case, piece of junk that it may be, for anticipating greater demand for gas than is inferred by recognizing that demand for electricity is currently trending flat (only for the last few years, having leveled off after a longer downward trend) and also for anticipating greater demand for petroleum than is inferred by recognizing an electric vehicle revolution just getting underway. If we take the EV revolution – which seems to account for much of the leveling in electric trend and quite litkely to push it dramatically upward over the coming decades – into account in both scenarios, I agree that the Petro projections seem far too high, but something is going to meet the increased demand for electricity that replaces it. Can solar and wind can pick up all the slack in real time? I sure hope so. Gas may be cleaner than coal, but it's commonly extracted by fracking which certainly isn't eco-friendly. From 2000 to 2010, I regularly traveled to Lincoln, NE on quarterly business trips. You see a lot of trains on that drive, mostly very long coal trains. Lincoln seems to be some sort of coal train hub. As the years passed I noticed that the coal trains seemed to be not quite so long, and there appeared, occasionally at first but more and more by the end of the decade, flatbed cars (and semis on the highway) carrying huge windmill blades. I'm encouraged by that and can only imagine how it's trended since. Petroleum is not used in the USA for electric generation to any significant extent – just diesel backup generators for emergencies. There are no plans by utilities to switch to it. Why should they, since gas is plentiful, cheap, and convenient? I doubt if even the NERA hacks are assuming this. The beach calls, I don't feel like wasting more time doubling down on the hack proof. World growth in demand for electricity has shrunk to 1%, effectively nil per capita. The slowdown is not a blip. Since demand is rising in developing countries like India, it is falling in rich ones. The EIA historical statisticians document all this, but their forecasters live in a separate bubble. One of these days I'll look into the impact on electricity demand from mass EV adoption. It's not a one-for-one switch. You are replacing a 20% efficient system by an 80% efficient one. And charging will mostly be done overnight, when demand dips, and is even interruptible on a smart grid. This is why electric utilities love EVs: a new market with an ideal load curve.